Milk punch is something I’ve wanted to try for a few years now, but it was for this most recent New Year’s Eve that I finally decided to make it. I adapted it from the Smitten Kitchen recipe here. I decided I would a small batch with bourbon, and a small batch with brandy. Milk Punch says Happy New Year! Both were sweet and delicious. The whiskey one was assertive – you definitely need to like whiskey to drink it. The brandy one was easy to drink. 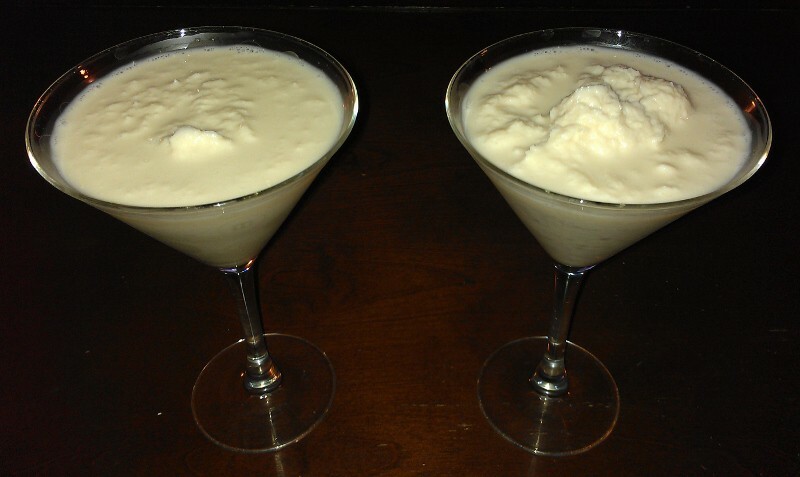 It was like drinking ice cream or a Brandy Alexander. I wouldn’t freeze these as long next time, because they were icy by the time we drank them. It’s also nice not frozen, but I think that having a little slush is preferable. 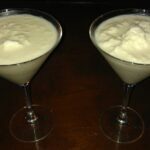 Milk punch was very easy to make, and easy to make in advance. I know I’ll make this again. Want other festive recipes? Try Peach Bellinis and Strawberry Bellinis. This recipe makes a half batch of the original. It only takes minutes to mix together, but will need to chill for 2-3 hours. Whisk the ingredients together, and freeze until slushy. I suggest 2-3 hours; it was kind of icy at 4. Stir well before serving.